SMOOSH Blankets™, SMOOSH Yarn™ & SMOOSH Stix™ Add a little SMOOSH to your life! Super Soft "SMOOSH BLANKET . 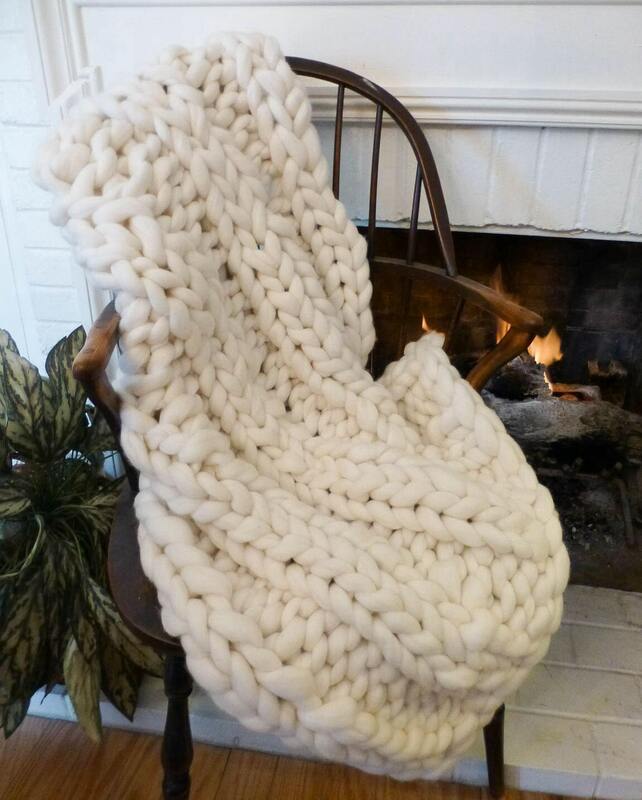 A super soft, luscious cloud of pure Merino wool with deep pockets of warmth created by the traditional 2by2 ribbing. 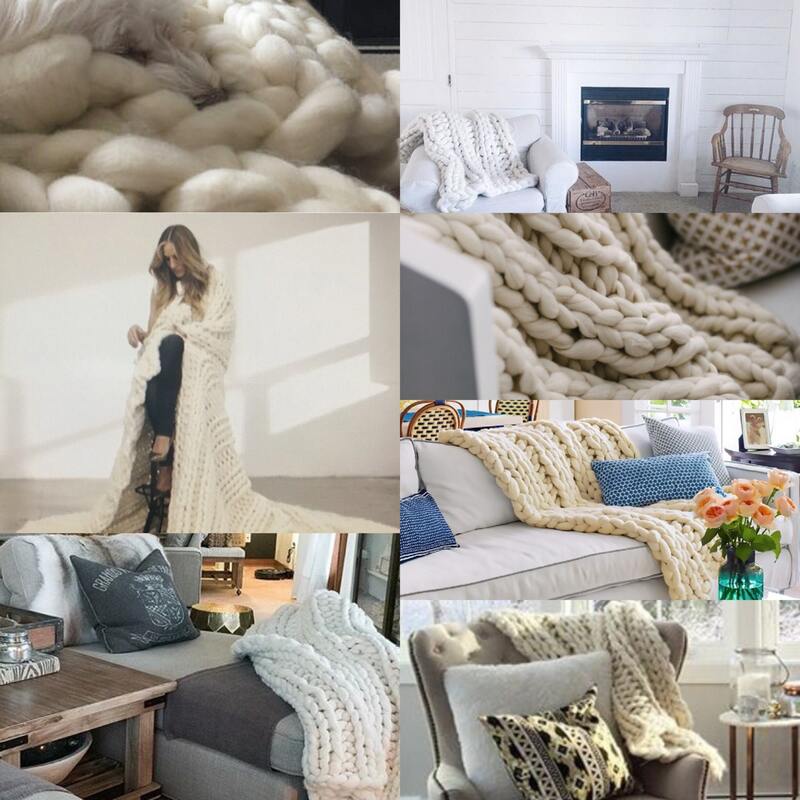 Hànd knit from one-of-a-kind, pure SuperSoft hand spun wool, and...wool is a sustainable resource. Most Merino wool is produced organically, and the processing of wool requires very little environmental impact compared to other natural fibers or man-made fibers. Custom blankets available in other sizes and colors! Please contact us if you have a different size or color in mind! Colors may vary due to monitor settings and or lighting factors. Since each order is a large investment in materials and labor we can not accept returns on color choice orders. Exchanges are determined on individual order basis. Remember, since our yarn is processed and spun, its loftier and takes less then plain wool roving - here's some basic usage guidelines using our 120 needles and SMOOSH™ Yarn. We don't send you wool that is simply repackaged from a wool mill - our original SMOOSH Pure Merino yarn is truly unique in that we take the time to process and lightly spin it into a real yarn product. This is why SMOOSH yarn can take a little extra time to receive.Smoosh Yarns and Blankets are more durable, shed less, last longer and our blankets are not made with plain wool roving. Please read the rest of our FAQ’s for more about why your SMOOSH Yarn™ Or SMOOSH Blanket™ Is truly one of a kind! We are sorry, but we can not be held responsible, or refund, stolen or packages not picked after attempted delivery. If you require your package to be delivered with a signature confirmation please contact us so we may note your order. We use 100% merino wool for all our products. Dry cleaning is best. Gentle spot cleaning if necessary. Do not machine wash or dry. All of our wool is lightly processed with an all natural, lightly scented wool wash. 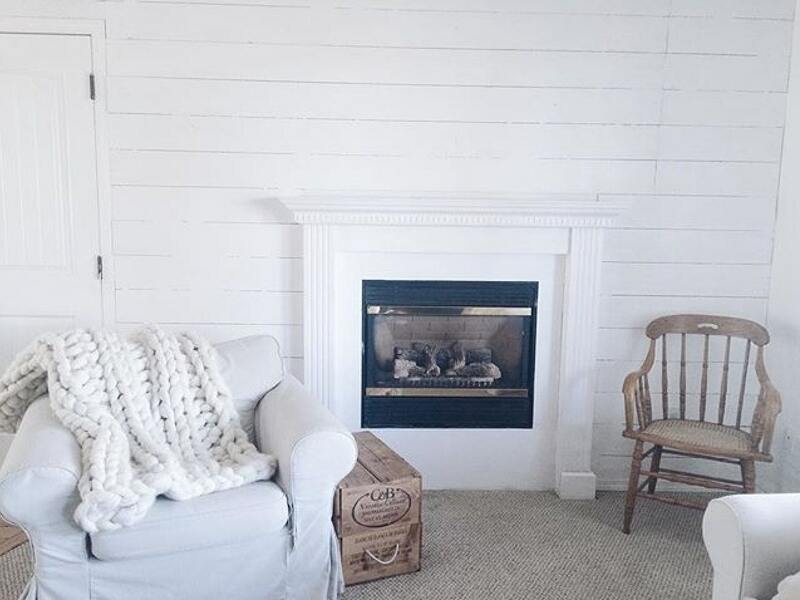 This scent (A natural fresh clean scent) will completely disappear within hours of receiving, and your blanket (or yarn) will quickly settle into your home! Large quantity bulk orders are available at a reduced rate. Large scale knitting is extremely moveable. All sizing is done laid flat, not stretched. Due to the nature of the fabric, the sizing is very changeable and can vary... Each item is measured before shipping and will be at least the size advertised, but can 'grow' with use. What is the difference between SMOOSH yarn and plain wool roving? My product is a spun, lightly felted yarn, not the plain wool roving you can find other places, which provides strength, durability and 95% less shedding... our yarn has been made this way for many years and has lasted the test of time! My process allows for the same giant size, but eliminates the problems with using roving ... Roving breaks and tears, sheds like crazy and creates a very heavy Item! SMOOSH yarn is giant, airy, light and easy to work with! On Etsy since early 2013 and In local markets and boutiques prior, well before the ‘chunky craze’ hit the world, my process has been developed over many years of trial and error, to find the perfect mix of spin, felting,and sizing, to make a beautiful, yet durable blanket or project! What size needle do I need? We recommend our giant size 120 needles for best results with our yarn. Anything smaller such US size 50's and below will create a more dense heavier fabric, and require more yarn. Why choose a SMOOSH bkanket? SMOOSH blankets are made with our SMOOSH Pure Merino Wool Yarn, and not plain raw wool roving seen in other shops or websites. The process of lightly spinning and felting the wool to create our yarn provides strength, durability, and reduces shedding and tearing by 95% ... Using this yarn to create our SMOOSH blankets means your blanket will be lighter, fluffier and softer than any other! 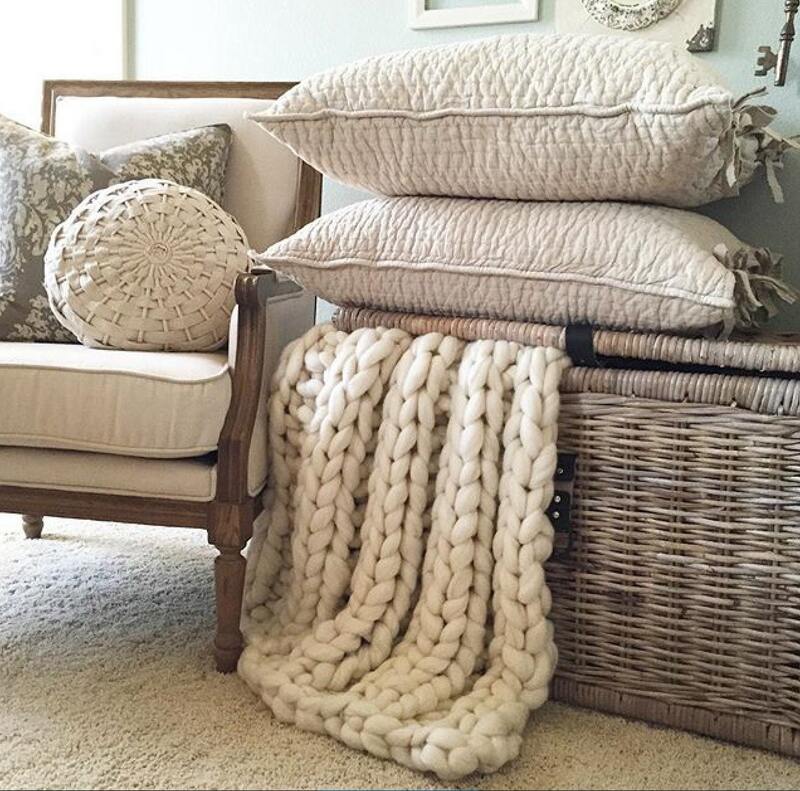 We have been selling our blankets and yarn on Etsy for many years, and in local boutiques and markets well before that - our blankets have withstood the test of time! Our pattern booklet (in English ) is provided with all knit kits and yarn purchase. It includes 5 style blanket patterns, and 2-3 small project bonus patterns. It also has some tips and tricks for large scale knitting and sizing details with cast on information. It is not a basic knitting tutorial however, and some basic knitting knowledge, while not needed, is helpful. All patterns are beginner level and require only basic knowledge of cast on, knit and purl techniques. The blanket was amazing. So soft and wrapped with love. Shows you take great pride in your work. Giving as a birthday present this weekend and I know she will appreciate it!